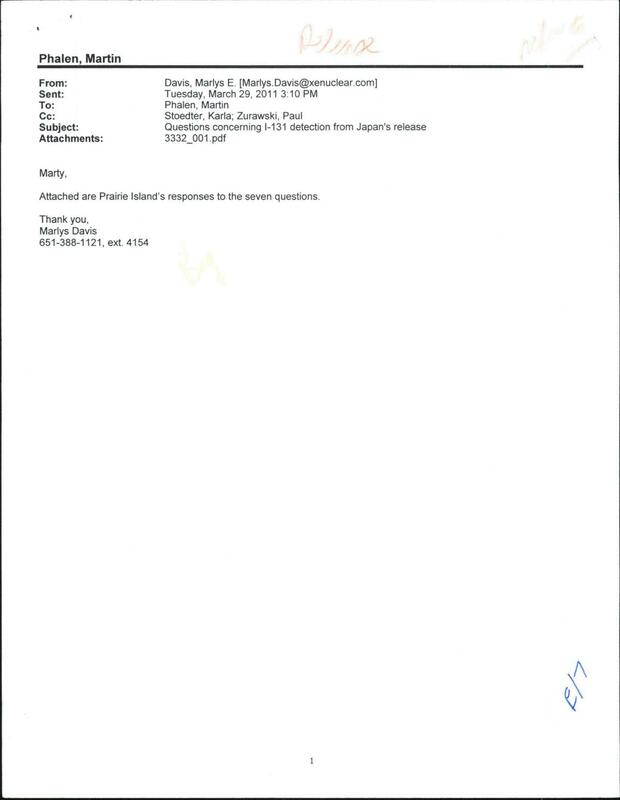 Attached are Prairie Island’s responses to the seven questions. 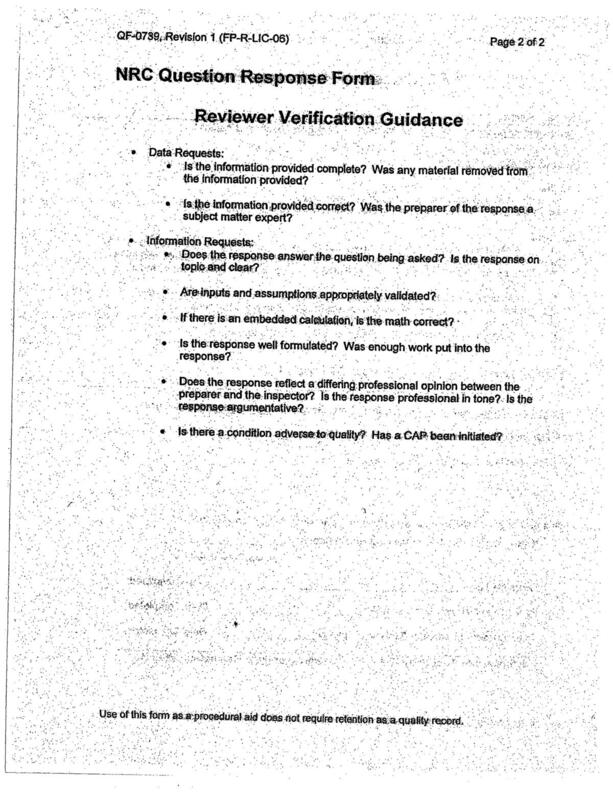 The answers to the following questions only include data from March, 2011. 1. Drinking water station sample results including sample locations, dates results and MDA. 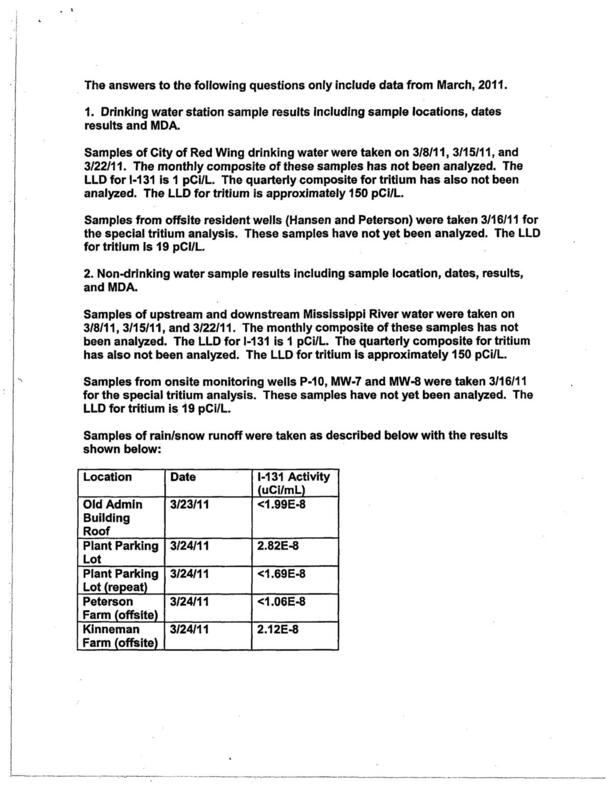 Samples of City of Red Wing drinking water were taken on 3/18/11, 3/15/11, and 3/22/11. The monthly composite of these samples has not been analyzed. The LLD for 1-131 is 1 pCi/L. The quarterly composite for tritium has also not been analyzed. The LLD for tritium is approximately 150 pCi/L. 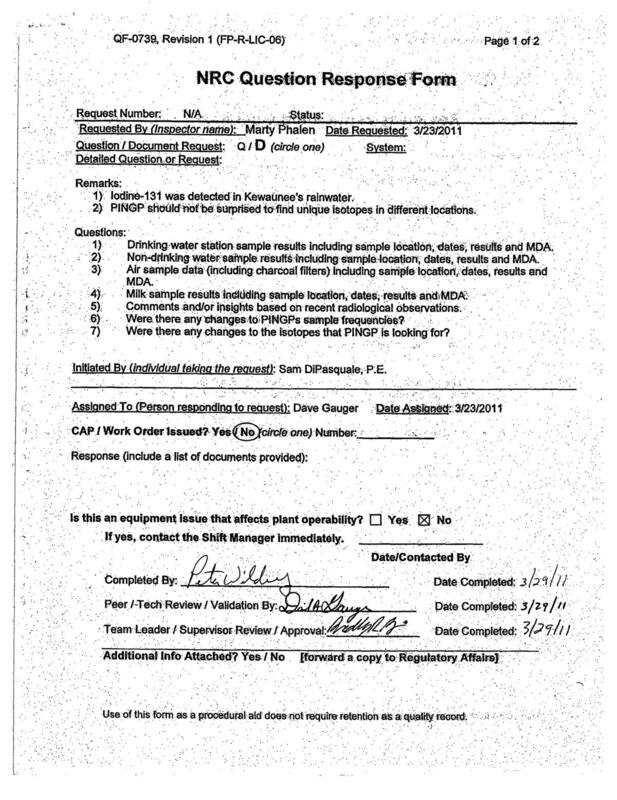 Samples from offslte resident wells (Hansen and Peterson) were taken 3/16/11 for the special tritium analysis. These samples have not yet been analyzed. The LLD for tritium Is 19 pCI/L. 2. Non-drinking water sample results including sample location, dates, results, and MDA. been analyzed. The LLD for 1-131 is I pCi/L. The quarterly composite for tritium has also not been analyzed. The LLD for tritium is approximately 150 pCi/L. Samples from onsite monitoring wells P-10, MW-7 and MW-8 were taken 3/16111 for the special tritium analysis. These samples have not yet been analyzed. TheLLD for tritium is 19 pCi/L. 3. Air sample data (including charcoal filters)’including sample location, dates, results, and MDA. Samples of particulate and charcoal filters were taken at air monitoring stations P-I, P-2, P-3, P-4, and P-6 on 3/8/11, 3/15/11, and 3/22/11. The only samples with positive 1-131 results are shown below. The LLD for gross beta is 0.005 pCi/m3 , and 0.03 pCi/m3 for 1-131. 4. Milk sample results including sample location, dates, results, and MDA. 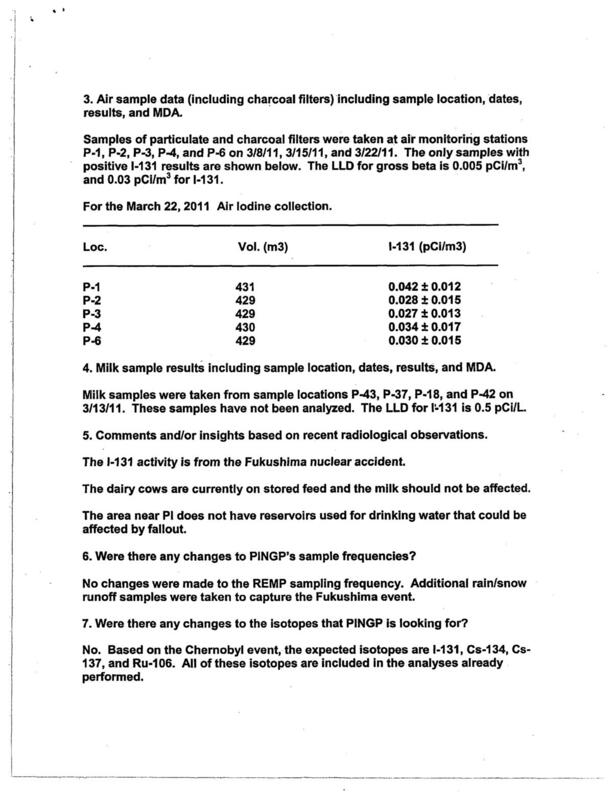 Milk samples were taken from sample locations P-43, P-37, P-18, and P-42 on 3/13/11. These samples have not been analyzed. The LLD for I;131 is 0.5 pCi/L. 5. Comments and/or insights based on recent radiological observations. The 1-131 activity is from the Fukushima nuclear accident. The dairy cows are currently on stored feed and the milk should not be affected. The area near PI does not have reservoirs used for drinking water that could be affected by fallout. 6. Were there any changes to PINGP’s sample frequencies? No changes were made to the REMP sampling frequency. Additional rainisnow runoff samples were taken to capture the Fukushima event. 7. Were there any changes to the isotopes that PINGP is looking for? No. Based on the Chernobyl event, the expected isotopes are 1-131, Cs-134, Cs- 137, and Ru-106. All of these isotopes are included in the analyses already performed.